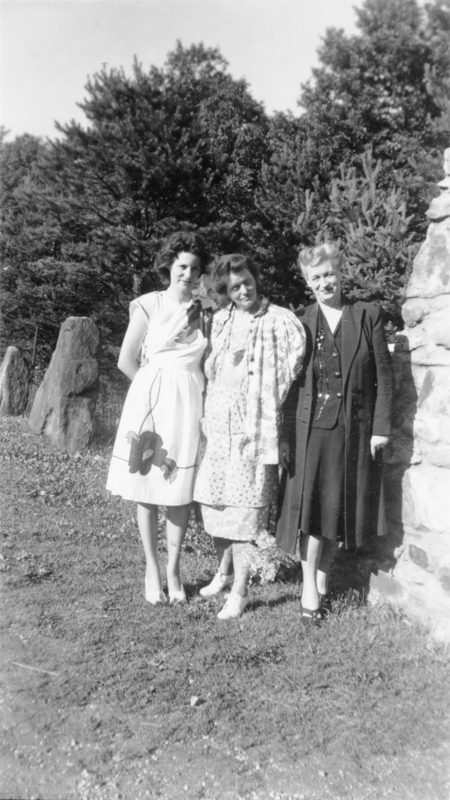 This photograph depicts (from left to right) Mildred "Millie" M. (Wichman) Fitch, Miss McCleery (I am unsure if this is Mary Nourse Byham McCleery or Helen Catherine McCleery, but I believe it is probably Helen Catherine McCleery), and Rose V. Carroll, standing at the entrance to Dr. McCleery's lobo wolf park, located along Route 6 five miles east of Kane, PA. The stone archway, and two large, flat rocks are also visible. 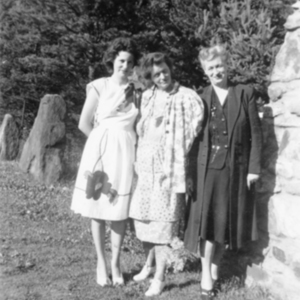 The back of the photo reads "Mme, Miss Cleary, Miss Carol" (Mildred went by Mimi).